I go to lots of conferences and seminars. The result of this, (apart from the addiction to buffet food) is that I now speak a different language – ‘Jargy Jargy’ or Jargon, “the specialist language for a specific activity or group of people” (I’ve gone on about this before). If you stop and think about it for a moment, I’m sure lots of people will recognise the affliction, if you aren’t suffering yourself (you are probably fibbing), you will know someone who is. My Jargy Jargy affliction has been troubling me a lot lately. I’ve been particularly concerned because I’ve been speaking at co-productuion meetings with Working With No To (a network of people doing co-production in Wales). Co-production is all about working together, no barriers, everyone included, no speaking down to people. Real people come to these events! How on earth are they going to understand the nonsense I garble at 300 words a minute, let alone the jargon I use? Well the good news is that I’m working on my fast talking and trying to eliminate the jargon. But the really good news, I’ve experienced the Listening Service from Barod CIC, a community interest company which specialised in clear communication and making services accessible to everyone. Speakers (some, not all) will change what they say, and how they say it. What is the impact of the Listening Service? Having been in the room when the Listening Service is being provided I’ve seen interesting things happen. Some speakers have completely changed their presentations. It’s funny how the realisation that you are going to be ‘translated’ helps people do what they should have been doing in the first place. I know it had a big impact on me. The best way to show some of the impact of the Listening Service are three tweets about the Re-shaping services with the Public event I was at last week (have a look at the summary of the #reshapeservices storify of the tweets here). This was the first time the Listening Service has been used fully, and the feedback is impressive (and interesting). This pretty much says it all about inclusion and allowing everyone to access what was going on in the event……“today is the 1st time we’ve been a real part”. Imaging if we could reach that level of involvement in all conferences, particularly if they are talking about ‘service user needs’ and co-production. This is an interesting one I never expected, but now I think about it, it makes perfect sense. Whilst I was sitting there trying to translate what was being said, and share it with the outside world via Twitter, I must admit, I did struggle on times. It would have been far easier to pick out the ‘Tweetable’ gems of information from the Listening Service and share them, rather than try to do two jobs at once. This is a bit of a sobering thought. I did some of the speaking on the day. Was this my slot where “nothing had really been said”? It might have been, I was mostly doing the housekeeping notices and continuity, so I can cope with that…. but it’s a huge lesson. If the Listening Service is silent whist you are speaking, that’s because you aren’t saying anything very useful…. have a think about that,… the ultimate test of conference presentation usefulness! One final thing. You might have spotted the party blower picture at the top and were wondering what it is all about? 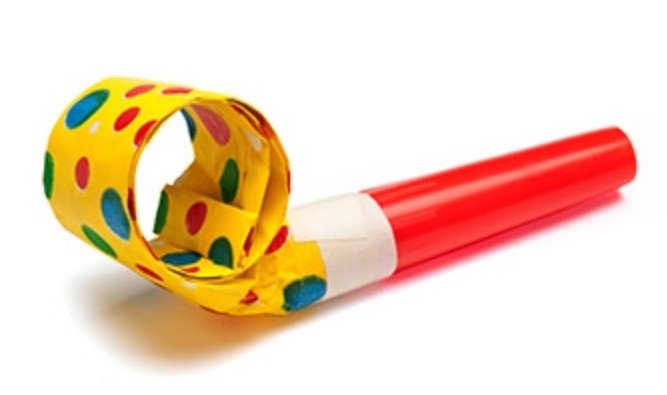 Barod also ran a workshop which involved people blowing the party blowers when they heard jargon in a passage of typical public service communication that was being read out. I was in the room next door, it was a riot of noise. Specialist groups or topics do develop a language of jargon that is often helpful in how they communicate with each other, within the group or about the topic. People from outside the group can be excluded if they don’t understand the jargon, or it isn’t translated for them. The Listening Service is a useful way of breaking through jargon (Jargy Jargy) used at conferences and seminars, and also provides other benefits of; including people, providing Tweetable messages, and it is the ultimate test of… how useful is your presentation. I love this idea Chris. It’s so easy to spot other people’s use of jargon and so hard to notice one’s own. We’re finding this already with the Bromford Lab. We’re passionate about it being open and accessible…..a collaboration….a network….so we’re on guard against ‘jargon creep’ into the lab from all sorts of different sectors and professions; to prevent us ending up speaking the ‘Esperanto of jargon’ – a language no one understands! I think jargon has it’s place and can be very helpful when it helps the communication in a specialist group. It can also help with establishing a group or team identity…. the sort of thing that works in schoolyard tribes. The problems happen when it is used to exclude outsider, sometimes intentionally I fear. I’ve had a bunch of Doctors talk jargon over me and about me in hospital, it was pretty awful. It’s good to hear that the Lab is guarding against ‘jargon creep’. Mixing with lots of different groups is a good way of doing this, while you keep a look out for Esperanto Jargon. Having seen it in action in several events its easy to see how it changes the dynamic in the room. People self-regulate their vocabulary and think about how they can contribute meaningfully. Speaking slower and with more care also increases the quality of the conversations as people also listen better.